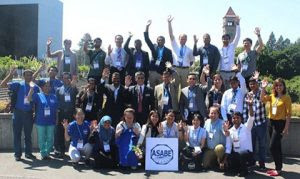 Nearly 50 graduate students and faculty members represented the Department of Biological Systems Engineering at the Annual International Meeting (AIM) of the American Society of Agricultural and Biological Engineers (ASABE), held July 16-19 in Spokane. Thirty-four BSE graduate students volunteered at the meeting, which was coordinated by Jonathan Lomber, BSE Scientific Laboratory Manager. Attended by more than 1,700 students and professionals, the meeting helps expand awareness of current industry trends, promote and acknowledge innovations in design and technology, and provide opportunities for professional development. Qin Zhang, BSE professor and director of the Center for Precision & Automated Agricultural Systems (CPAAS), received the John Deere Gold Medal Award in recognition of his engineering contributions. Two BSE graduate students were recognized for excellence in conduct and presentation of agricultural and biological engineering research, receiving the Boyd-Scott Graduate Research Awards. The competition includes a written competition and an oral presentation for the top three finalists in the masters and doctoral categories. Prior to the ASABE Annual International Meeting, BSE led a workshop to promote graduate education and research. Chairs of peer departments from Iowa State University, Purdue University, Cornell University, Texas A&M University, and the University of Illinois participated in this brainstorming workshop. Representatives from ASABE and USDA National Institute for Food and Agriculture (NIFA) program leaders also took part. Following the ASABE conference, BSE hosted a forum to highlight its ongoing advanced research and encourage international collaborations. In addition to USDA-NIFA program leader, Hongda Chen, research experts from China, Spain, Ireland, Brazil, and Mexico, took part.